Fold-out Nativity postcard; die-cut, glossy, embossed cardstock, 5.5 x 4.5 x 1 inches. To add a Christmas touch, just place this small pop-up nativity anywhere. A much larger version, the vintageAlpine Nativity, features the same figures but a different setting — with icicles! Fans of paper nativities recognize this small (5.5 x 4.5 x 1 inches) Censer fold-out nativity as a delightful variation of larger originals. Many crèche enthusiasts, in fact, just might prefer this small re-issue to much larger versions (see photo of the Alpine Nativity, left). That's because its small size means you can decorate with it in so many different ways. And because its reduced size has not diminished its beauty. The Magi: richly robed, two kneeling and one standing, they offer their gifts to the Newborn Child. Dressed in red and trimmed in ermine, the King on the left holds a censer — hence the name — that fills the air with the sweet smell of his gift — Frankincense. The Holy Family: Mary, cradling the Baby, and Joseph, resting his hand on a cane, are the same figures encountered in so many other natitivies. The Kneeling Shepherd:Almost better visible in the vintage variation (above), a young shepherd with his long crook kneels to the left. Ox, donkey, and lamb:A sheep grazes between two Magi, and an ox is found in its pen to the right of Mary. It's hard to see in our photos, but certainly visible in the3-dimensional,fold-out nativity. 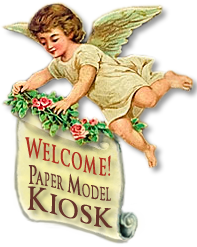 The Manger:Part of the great enjoyment of collecting paper nativities is seeing how the great artistic invention, especially in the rendering of the manger. The Censer Nativity is set in a thatched-roof manger (unlike the Alpine crèches, above) And, in fact, it is the setting that tends to differ in all the different editions while the figures remain the same, albeit in different scales. A flower bush blooms on the right, a banana tree grows on the left, and on the roof the words "Gloria in Excelsis Deo!" proclaim the good news of Christ's birth. The background — with a die-cut small roof railing and twin arched windows — is draped with a green garland. And, on either side, a climbing rose and a palm tree reach heavenward. 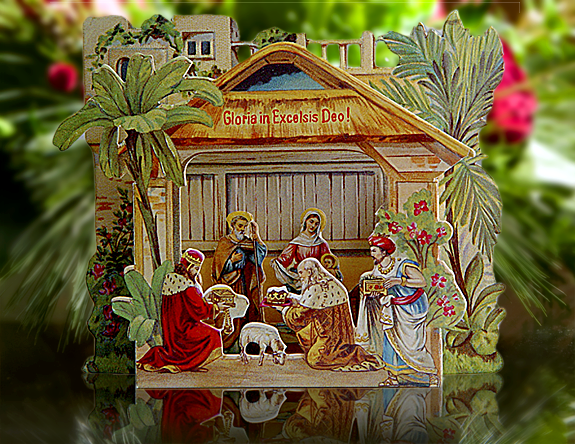 TheCrechemania.comcollection contains other vintage nativitiesthat share many features with theCenser fold-out Nativity. To see them, just click the More Pages Angel (on the right). This small thatched-roof, fold-out nativity scene looks perfect just about anywhere, especially as an accent with a Christmas bouquet. But, Spencer likes to decorate his Christmas tree with it. Size: 5.5 x 4.5 x 1 inches.